Click the button below to download the SendGuard installer. An enhanced version of SendGuard is also available to scan inside your attachments for text, regex's etc. This funtionality is available for an additional fee and only on request. Visit our help page or contact our support team support@standss.com for more information. The Download button above (recommended) will download a file that works with both 32 Bit and 64 Bit versions of Outlook 2007 and above, and Office 365. You can also download a 32-Bit MSI or 64-Bit MSI installer. Run the downloaded executable file (SendGuard.exe). SendGuard startup Wizard will automatically display when Outlook starts to help you setup SendGuard. SendGuard will also appear on the Outlook Ribbon. Once you have installed SendGuard (instructions above), restart Outlook. SendGuard will start working and protecting you using the pre-configured settings. You can enable/disable and configure the various components (SendConfirm, ReplyGaurd, Send Rules, AccountGuard, SubjectGuard or DelayGuard) from the Settings screen. 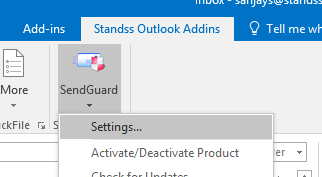 To access the SendGuard Settings screen, click on the Standss Outlook Addins tab on the Ribbon. Click the SendGuard icon and then click Settings. SendGuard helps you protect your company and yourself from making the same common mistakes of sending emails to the wrong recipients.